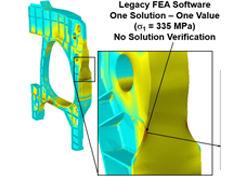 This webinar will share advancements in numerical simulation that make the performance of finite element analysis S.A.F.E.R. – Simple, Accurate, Fast, Efficient, and Reliable. It will present an example engineering design problem from the aviation industry, requiring accurate results around stress concentrations to meet durability requirements for a long crack initiation life.